Aussie Gold Rush - Exclusive to R.B.D & Irises. Details : Ht 30" Ev. TET. E-M Re. 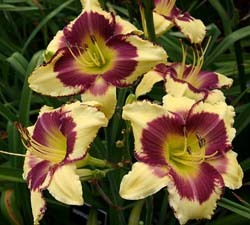 Bl 5.25"
Bright yellow blooms with a darker yellow centre and matching ruffled edges. High bud count. A favourite yellow. Aussie Popcorn - Exclusive to R.B.D & Irises. Pale yellow blooms with an apricot centre. Petal edges crimped and laced. 100% Double. A great performer . Prolific. Details : 26" Ev. Dip. E. Re. Bl. 5.5"
Details : Ht 26"TET. EV E-M Re. Bl 5"
Yellow with plum eye and edge and a green throat. Prolific. Details : 32" Ev. Dip. M Re. Bl 7"
Bright blooms of golden yellow with a red-mahogany eye. Limited Stock - 1 per customer. Claire Cornish - Exclusive to R.B.D & Irises. Details : Ht 32" Ev. TET. M Re. Bl 6"
Clean golden cream blooms with gorgeous large loose ruffling. Named after a dear friend. Another image of this cultivar (with a few blooms) in "Shelli's Intro's"
Details : 27"Ev. Tet E-M Re. Bl 6"
Bright yellow with a green throat. Waxy heavy substance. Ruffled blooms of great form. limited stock - 1 per customer. Details : 20" Ev. Dip. E. Re. Bl. 3.5"
Colour is a lovely honey-peach with a striking ruby-red eye. Lime green throat. Details : 18" Ev. Tet. E. Re. Bl 3.5"
Details : Ht 27" TET. EV. M - E Re. Bl 7" (75% Dbles). Details : 28" SEv. Tet. E-M Re. Bl 6"
Yellow gold, raised sculptured midribs, green throat. 35 buds. Great for hybridising. Limited stock 1 per customer. Details : Ht 26" TET. Ev E Re. Bl 6"
Clear bright yellow with a toothy ruffled edge. Citron green throat. Glow Monster - New! Exclusive to R.B.D & Irises. Monstrous blooms - the biggest I have ever seen! Blooms open in a clear glowing bright yellow in the morning then deepens during the day to a gold with paler softly ruffled edges. Unusual Form. Hugely stands out in the garden on tall scapes. Amazing! Details : 21" SEv. Tet. 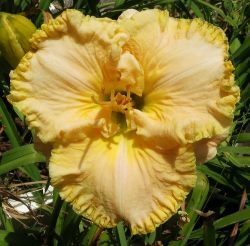 M-L Re Bl 6"
Masses of large creamy yellow blooms. Gorgeous picotee edge often having large hooks. Limited stock - 1 per customer. Details : Ht 18" TET. M. SEv. Re. Bl 5.5"
A blend of cream lime yellow with a distinctive bold green edge and throat. Limited supplies - 1 per customer. Details : Ht 26" DIP Ev. E Re. Bl 6.5"
A smaller variety of spider. Yellow green with a very deep green throat. Limited stock. 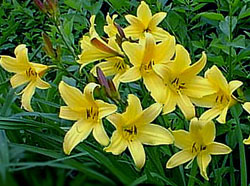 Hemerocallis lilioasphodelus grows in big spreading clumps, its leaves grow to 75 cm (30 in) long. The blooms are lemon-yellow with a sweet scent in a cluster of 3 to 9 flowers on long scapes. Limited stock - 1 per customer. Details : Ht 26" TET. Mid. S.Ev. Re. Bl 5"
Cream with yellow undertones and pink blush with a large lemon green ruffled edge. Green throat. Limited stock - 1 per customer. Details : Ht 18" Dip Ev. E- M Re. Bl 2.75"
Yellow with washed lavender purple eye and green throat. An outstanding miniature that has won many awards. Details : Ht 42" Dip. SEv. E-M. Bl 9"
A soft buff-yellow with a large striking rose eyezone and a green throat. Details : Ht 21" DIP.SEv. E. Re. Bl 6"
Large shimmering gold, lightly ruffled and creped. Green throat. Details : Ht 25"Dip Ev. M Bl 6"
Cadmiun yellow with a pink blush. Consistently double blooms. Limited stock - 1 per customer. Details : 36" Dip. Ev. E. Re. Bl 8"- 10"
Magnificent gold with mahogany eyezone and gold green throat. Polypetals also. Details : 22" Ev. Dip. E-M. Re. Bl. 4.75"
Details : 30" SEv. Dip. M. Bl 8.5"
Large open strappy straw-yellow flowers with a maroon chevron on petals and echoing more faintly on sepals. Details : Ht 24" TET. SEv. E-M. Re. 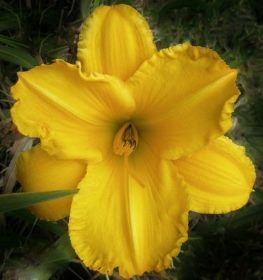 Bl 6.�"
Ruffled big blooms of bold brilliant gold - diamond dusting, shows luminosity that daylilies are capable of. Cool green throat. Details : 25" Ev. Tet. E-M Re. Bl. 4"
A clear luminescent yellow with a black eye and slight black picotee. The throat is deep emerald green. A lot like a black eyed big yellow pansy. Large rounded clean bright yellow blooms with an eye that has a lovely mixture of colours - magenta, grey, white and violet. The deep green throat sets this bloom off. Details : Ht 28 TET. Mid Re. Bl 6"
Butter yellow self with green throat. Details : 30" Ev. Tet. M. Re. Bl. 6"
Large blooms up to 8" here that are a clear pale, soft yellow with a wide pastel rose eye surrounding a large green throat. Pretty, a favourite. Details : Ht 32" TET. E-Mid Re. Bl 6"
First time on offer. A spectacular bloom. Lovely rounded blooms with large perfect ruffles on clear clean pale lemon with lime undertones. Green throat. Fragrant. 3-4 way branching. Prolific. A cream to light yellow with deeper yellow to gold showing up in the sculpting of the petal and its edges. Very rounded blooms with gorgeous ruffling surronding all petals. Emerald green throat. Details : Ht 24" Dip Ev. E. Re. Bl: 2.5"
Dark yellow blooms with near-black stems and buds. 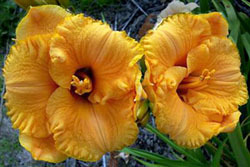 The name describes the unique aspect of this daylily. Blooms are flared trumpet. Rapid increaser and hardy. Details : 24" SEv. Tet. E-M. Bl. 3.5"
A lovely bright ruffled, rounded mini. Golden orange with a lime heart. Heaps of blooms, looks superb growing in a tub. Details : Ht 40cm Ev. Bl 4"
A hardy small growing plant that clumps up quickly. Great for garden borders or pots. Prolific and popular. Limited stock - 1 per customer. Details : Ht 28" TET. SEv. E-M. Re. Bl 5�"
A clean yellow with a wine purple eye. An amazing thich matching edge, with horns of silver. Very attractive. Limited stock. Details : Ht. 26" Ev. Tet. E. Re. Bl 6"
Bright chrome yellow, heavy substance, full rounded and ruffled form. Details : 26" Ev. Tet. E-M Re. Bl 7"
A gorgeous bright clean lemon yellow. A Stand-out bloom that is rounded opened and wide with large ruffles. An excellent quality yellow. A favourite. Limited stock - 1 per customer. Details : 30" Dip. Ev. M. Re. Bl. 6.5"
Light, bright yellow with a green throat. Tall scapes - good for background filler. Details : Ht 24" TET. SEv. M Re. Bl 6.5"
Soft pink and gold tightly crimped with a heavy gold edge. Limited stock - 1 per customer. Details : 24" SEv. Tet. E-M. Hyb. Re. Bl 6.25"
Gorgeous large golden yellow blooms with a green throat. Limited stock - 1 per customer.